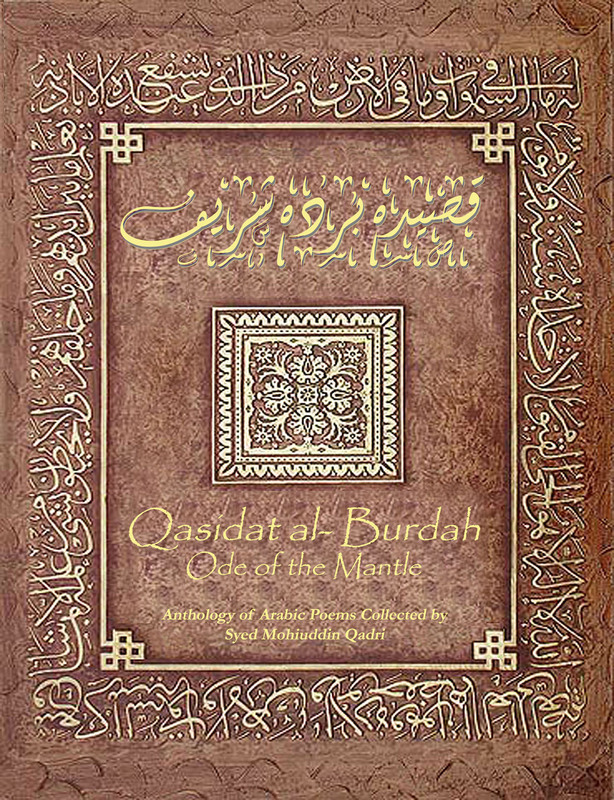 In the anthology of Arabic poems, the Qasida Burdah has had a great impact upon the history of the qasida genre as a whole. No other Arabic poem has been more frequently recited, translated, imitated or commented upon in so many languages of the Islamic world. The Qasida Burdah, al-Busiri’s most famous poem in praise of the Prophet, is about 160 to 165 lines long. Its appellation “al-Burdah”, meaning a mantle of woollen cloth in Arabic, refers to another highly esteemed poem in praise of Muhammad which is known after its opening words as “Banat Su ́ad” and was composed by Ka`b b. Zuhayr. After the recitation Ka`b received, as a reward for his poem, the Prophet’s mantle. When al- Busiri, some 650 years later, suffered a stroke and remained semi-paralysed, the Prophet appeared to him in dream guise, touched him with his hand and threw his mantle over his shoulders. Hazrat Busiri was instantly cured and set about to compose his poem called, in reference to this miraculous healing, the “Ode of the Mantle”. Taking its place among the most famous and widely read odes in the world, this work, just as it has been translated into all languages of great cultures, has also been translated into local dialects in Africa, Southeast Asia and the Balkans. The poem has been translated repeatedly into European languages since two centuries: into Latin (as Carmen Mysticum Borda Dictum, 1761), into English by J.W. Redhouse (Glasgow 1881), Faizlullah-Bhai (Bombay 1893), Arthur Jefferey (1962), Stefan Sperl (1996) and, recently, Hamza Yusuf (2005), into French by de Sacy (1822), Rene Basset (1894) and Hamza Boubakeur (1980), into Italian by Giuseppe Gabrieli (1901) and, finally, into German by Vincenz von Rosenzweig-Schwanau (1824), C.A. Ralfs (1860) and Uwe Topper (1991). The actual title of the poem, however, is not Qasida al-Burdah, but “al-Kawâkib al-durrîya fî madh khayr al-barîya” which, in Jan Knappert’s translation, runs “The scintillating stars in praise of the Best of Mankind”. The poem was soon to become extremely popular and we know of at least a hundred commentaries, recensions, enlargements etc. Among its commentators, there are many famous scholars, poets and men of letters, e.g. Ibn Abî Hajala al-Tilimsânî (d. 776 AH), Ibn Marzûq al-Tilimsânî (d. in Cairo 781 AH), Badr al-Dîn al-Zarkashî (d. in Cairo 794 AH), Jalâl al-Dîn al-Mahallî (d. in Cairo 864 AH), al-Jalâl al-Suyûtî (d. in Cairo 911 AH), Shihâb al-Dîn al- Qastallânî (d. in Cairo 923 AH), Zakarîyâ ́ al-Ansârî (d. in Cairo 926 AH), Ibn Hajar al-Haytamî (d. in Mecca 974 AH), `Abd al-Qâdir b. al-`Aydarûs (d. in Ahmadâbâd 1038 AH) and Nûr al-Dîn al-Halabî (d. in Cairo 1044/1635). It has been translated into all the major Islamic languages, ranging from Turkish and Persian to Urdu, Malay and Swahili; in many a palace of the Ottoman period (e.g. in the Cairene Bayt al-Suhaymî), verses of the poem were inscribed on the walls. Today the Burdah is recitated in various regions and countries, according to custom in different regions, during the Prophet ́s birthday celebrations (mawlid), on certain occasions in Ramadân, while washing the body of the dead, at circumcision, engagement and wedding ceremonies, on holy days and nights and also as a weekly scripture.. Many magical usages are connected to almost each of its verses, as explained in detail by the 13th/19th century commentator Ibrâhîm al-Bâjûrî al-Azharî (d. 1277 AH). The final prayer section is read for paralysis seven consecutive days and health is pleaded for from Allah. This poem is one of the noblest poetical productions of the seventh century after Islam. It holds its own against any of the best poems of the Abbaside times in florid diction, choice of words, and propriety of expression. perspicuity and charming eloquence of language, natural development of the train of thoughts, the subtlety of its transitions, current and harmonious flow of the metre, and absolute freedom from any kind of solecism. The poem abounds in a variety of images, similes and metaphors, which far from being indistinct, remote or forced are very distinct clear, apposite and happy, and are such as add greatly to the graphic description of the narrative and to a clear elucidation of the incidents alluded to, while monotony in the metre and the language is greatly relieved by various verbal figures so much indulged in by the Post-Islamitic poets. The figures of speech, both verbal and rhetorical, are such as command deep admiration because of their exquisiteness, elegance and propriety of application. The power of its artistry has been used in every period for keeping religious emotion vibrant and to keep alive love of Prophet Muhammad.